An artist's conception of a gamma-ray burst. If its jets don't point toward Earth, the GRB signal may go undetected, but their interaction with the dust and gas around it may reveal their presence. About 25 years ago, a powerful explosion tore through a star, firing off a burst of powerful gamma-rays away from Earth. 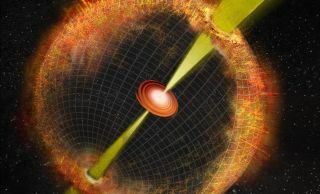 For the first time, astronomers have identified the ghostly remains of the explosion without spotting the explosion itself, a so-called orphan gamma-ray burst (GRB). The new object is helping to provide insight into a rare class of stellar explosions. Gamma-ray bursts are immense eruptions that pack a lot of power into a few seconds. Astronomers have spotted only a handful of them, despite the fact that they constantly light up the sky. The energy from the explosions produce two energetic beams at the stellar poles. If those beams don't point toward Earth — and scientists estimate only 1 in 100 do — they remain unseen to telescopes. Even if an explosion remains forever unseen, its aftermath should be visible from Earth, according to a statement about the new observations from the National Radio Astronomy Observatory. By combing through decades' worth of archived observations, a team of astronomers discovered the shock wave from an initial explosion as the jets crashed into the gas surrounding the original star. "This is exciting, and not just because it probably is the first 'orphan' GRB to be discovered," Casey Law, a researcher at the University of California, Berkeley, said in the statement. Law is the first author on the paper announcing the new signal, which can help to answer the outstanding questions about the explosions that generate the bursts and the objects left behind. "[The signal] also is the oldest well-localized GRB, and the long time period during which it has been observed means it can give us valuable new information about GRB afterglows," Law said. Gamma-ray bursts release an insane amount of radiation, as much as the sun produces over 10 billion years, in anywhere from a few milliseconds to a few hundred seconds. Their origins remain a mystery. According to one theory, a single massive star or a pair of either large massive stellar objects or compact neutron stars merge to create a highly magnetized, rapidly spinning dense star known as a magnetar. The jets produced interact with the gas and dust around the spinning star, creating a shock wave that heats up the gas. The resulting glow radiates radio energy in all directions. The collision of a pair of neutron stars linked with gravitational waves in 2017 was also connected with a GRB. But this time, the blast is nowhere to be seen. "This is the first time anyone has been able to capture the sonic boom from an unseen GRB explosion," co-author Bryan Gaensler, a researcher at the University of Toronto, said in a statement from that university. "In the past, people have either seen the explosion and then seen the boom, or on one or two occasions have seen the boom and then looked back and recovered the explosion after the fact. But here we have seen the boom, and yet the preceding explosion seems to be completely missing as viewed from Earth." Discovering the orphan GRB, known as J1419+3940, required digging through nearly four decades' worth of previous observations. While searching through the data of from the first observations made by the Very Large Array Sky Survey (VLASS) in late 2017, astronomers realized that an object from a 1994 VLA study was now missing. "We thought, 'That was weird,'" Law said in a statement from University of Berkeley. "Its peak brightness in the '90s was quite high, so it was a big, big change: about a factor of 50 decrease in brightness. We basically went through every radio survey, every radio dataset we could find, every archive in the world to piece together the story of what happened to this thing." The astronomers found that the object remained unseen as far back as 1975 until it burst on the scene in a VLA image from 1993. Its brightness peaked in 1994, then faded away slowly over 23 years, barely visible in a 2015 survey. This orphan gamma-ray burst flared and died out over a period of 25 years. Its peak brightness in 1993 was more than 50 times its brightness today. But the source itself remained a mystery. "We could find no convincing candidate for a detected GRB from this galaxy," Law said. The researchers considered whether the glow could have been caused by fading emissions from a compact object embedded in the dust or gas produced decades before by a supernova. However, the strength of radio emission from the object and the fact that it slowly evolved over time support the idea that it came from a gamma-ray burst. The orphan GRB lies at the edge of a dwarf galaxy with active star formation, 284 million light-years from Earth. This type of environment has been associated with gamma-ray bursts, the formation of magnetars, and fast radio bursts (another type of powerful, fleeting explosion) in previous research. The discovery provides crucial new insights into the nature of GRBs and their jets. "By comparing the number of 'orphaned' afterglows to those with GRBs preceding them, we can measure that fraction much more precisely than before," Law said. The team recommended continued study of the object, suggesting that it could produce fast radio bursts. Continued study could also provide insight into the nature of the dense neutron stars, the researchers said. "Until now, we've never seen how the afterglows of GRBs behave at such late times," co-author Brian Metzger, a researcher at Columbia University, said in the statement from NRAO. "If a neutron star is responsible for powering the GRB and is still active, this might give us an unprecedented opportunity to view this activity as the expanding ejecta from the supernova explosion finally becomes transparent." The research will be published in the Astrophysical Journal Letters and is accessible on the arXiv preprint server. Follow Nola Taylor Redd on Twitter @NolaTRedd Follow us on Twitter @Spacedotcom or on Facebook. Originally published on Space.com.